"I attended the grand opening of the the International Photography Museum in Huai'an as part of the 2011 International Photography Exhibition in Huai'an. A large selection of my works from "Afghanistan:The Perils of Freedom 1993-2009 was showcased alongside other international and Chinese photographers including Thomas Hoepker, Jason Florio and Wujialin. The museum is without doubt the most ambitious of its kind in the world and we hope that it will provide a platform for not only outstanding Chinese photography, but also an unprecedented venue for international photography to be shown in China. The museum will hold onto the exhibitions to become a part of its International Collections. In the words of my friend Thomas Hoepker, "this museum has the potential to become the Lourve of photography". 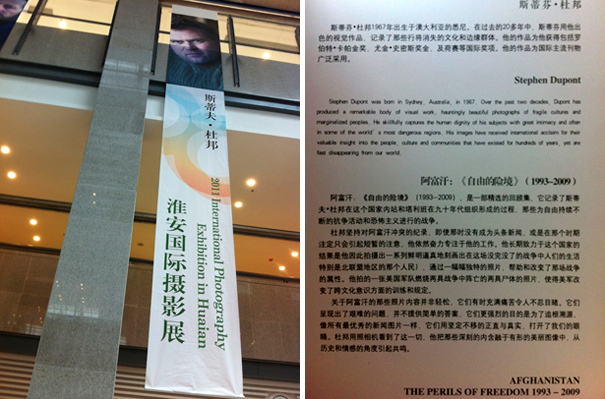 The 2011 International Photography Exhibition was curated by Zhimin Shi.